Titel: The Sea Our Other World. Album mit allen Karten. Ausgestellt 1974 von Brooke Bond Tea. Entitled : The Sea Our Other World. Album with all Cards. Issued in 1974 by Brooke Bond Tea. Album - complett mit Karten - Brooke Bond Tea. DIES IST EIN MUSS FÜR JEDEN FAN UND SAMMLER. Dies ist ein wunderbares Sammelalbum mit 50 Farb-Sammelkarten, in Großbritannien im Jahr 1974 produziert, die in ein Album geklebt werden konnten. Die Karten wurden mit Paketen von Brooke Bond Tee und Teebeutel dazu gegeben. Das Sammel-Album ist 185 x 124mm, und jede Karte (Quer-und Hochformat) ist 70 x 337mm. Die "Autoren sind drei bekannte und sehr angesehenen britischen Taucher: Dr. Nic Flemming hat die Einführung erstellt, der Autor Kendall McDonald hat den Text geschrieben, der Illustrator Ley Kenyon hat die hervorragende Farbabbildungen gefertigt. Man fragt sich, wie viele Menschen durch diese Karten zum tauchen ermutigt wurden, selbst einen Blick ins Meer zu werfen und die Ozeane zu erkunden. THIS IS A MUST HAVE FOR ANY FAN OR COLLECTOR. 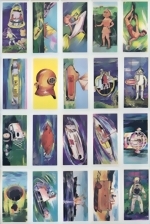 This is a delightful set of fifty small colour collectible cards, produced in the UK in 1974, which can be pasted into an album. The cards were given free with packets of Brooke Bond Tea and Tea bags; the album appears to have been sold for the princely sum of five pence. The landscape album is 185 x 124mm, and each card (landscape and portrait format) is 70 x 337mm. 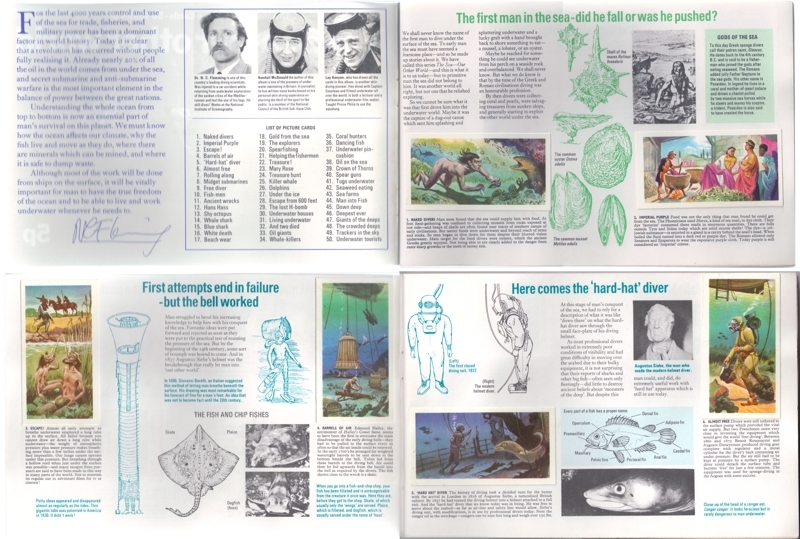 The 'authors' are three well-known and very well respected British divers: Dr Nic Flemming has provided the introduction; prolific author Kendall McDonald has written the text and author/illustrator Ley Kenyon has done the excellent colour illustrations. This would have been a most informative book in its day, and even today it is the type of book that you can pick up and delve into at any page and learn something. In addition to the illustrations provided by the cards, the book is also well illustraated in duo-tone, also with further drawings and diagrams. 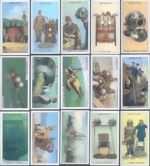 A great many of the cards have Divers in the pictures. Information is printed on the backs of the cards. 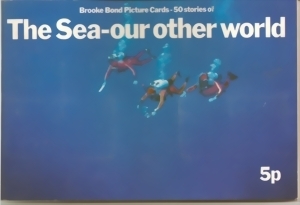 One wonders is how many people were encouraged to take up diving by these cards, to have a look for themselves what is under the sea, and to explore the oceans. This is an album with the full set of 50 cards.